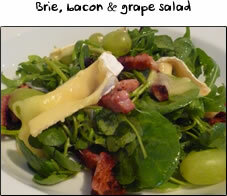 This is a great salad bursting with flavour. The mustardy marinade packs a punch and is offset by the sweetness of the apples. A sure fire winner for anyone who's counting the calories. This is a two part recipe. In part one we make the marinade. 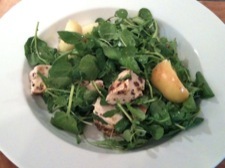 In part two we cook the chicken and prepare the salad. Before you start, have your mortar and pestle out on your work surface, along with the mustard, thyme, garlic clove and olive oil. Have the chicken waiting in the wings (sorry for rubbish joke) then click here! Before you start, preheat your grill to high (200c), have the chicken out, ready to go under the grill, all the other ingredients waiting on the work surface, then click here! Take the garlic clove and with the flat of the blade of a knife, give it a bash to break it slightly. Pop it into your mortar along with the thyme, and a pinch of salt and pepper. Give everything a good bash together with the pestle. Next add in 4 tablespoons of the mustard and stir it in with a spoon. Pop the marinade into a bowl and then using a sharp knife, score the chicken across the breast every inch or so, on both sides, so that the knife goes into the chicken but doesn't chop it up. Add the chicken to the marinade and rub the marinade all over he chicken, into the cuts that you made. Cover this and chill for at least 30 minutes. Preheat your grill to high (about 200c) and grill the chicken for 5 minutes on one side then turn it and grill it for 4 minutes on the other side. Once you turn the chicken, go and chop and core the apples into quarters, then half each quarter to make little chunks. Turn your kettle on and get the other ingredients out (salad, lemon, and the bowls to mix salad and make the dressing) and it should be about time to take the chicken out. Remove the chicken to a chopping board. Pop the apples in a pan on a medium heat with boiling water, enough just to cover them. Squeeze in the juice of half a lemon. Next you need to make the dressing. Using a small bowl or jar, add the juice of the other half of the lemon and three tablespoons of extra virgin olive oil, together with a small pinch of salt and pepper. Whisk this together, or shake if using a jar. Chop the chicken breasts into bite size chunks, and then go and drain the apples and take them to the work surface. Add the salad to your large mixing bowl and then add in the dressing. 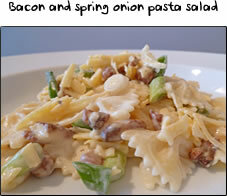 Mix lightly with your fingers to get everything mixed together and nicely coated with the dressing. 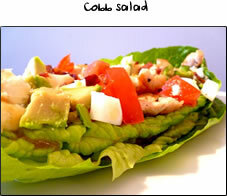 Take the chicken and toss that into the salad and mix, and then do the same with the apple. To serve, get one of your bowls or plate and put a big handful of the salad into the middle and you're done!